Google Chrome Blog: 50 Chrome Experiments and counting! The 50th Chrome Experiment, Sebastian Deutsch's 100 Tweets, shows a hint of the future by using the HTML5 canvas and audio tags. The audio tag, which is supported in Google Chrome Beta, allows audio playback without a plug-in. 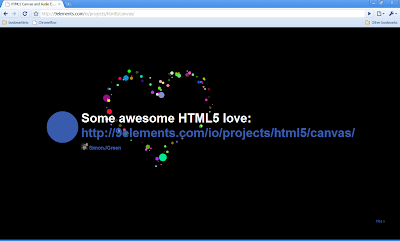 We're very excited about HTML5 becoming standard in modern browsers. If you're thinking about submitting an experiment to Chrome Experiments, we'd love to see some innovative uses of this new standard. We're especially psyched about the video and audio tags. If you haven't checked out Chrome Experiments recently, we hope that you take some time and explore all the latest experiments. Please keep the experiments coming, and, hopefully, we'll see you again at 100.